Given proper care, the right amount of sun, soil and water, many vegetables will grow successfully in containers placed on windowsills, porches and patios. Start your own container garden and in no time you’ll be enjoying the “fruits” of your labor. Growing vegetables in a container lets you control the amount of light, water and nutrients your plant receives. Vegetables can be grown in a variety of containers including wooden boxes, window planters, buckets, metal wash bins, wooden barrels or large pots. It’s important to be selective when choosing your container. Keep in mind size, color and drainage of the container. Larger pots won’t need to be watered as often. Dark colored containers absorb and maintain more heat, which can damage the roots of your plants. All containers need to have drainage holes at the bottom to release excess water. 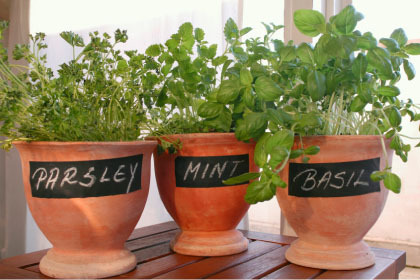 When it comes to container gardening, using a potting mix is your best bet. It takes the guesswork out of pH balancing and allows plants to get enough air and water to the roots. Adding soil polymers (small crystals that absorb large amounts of water) will supply moisture to roots between waterings. A container garden gets all of its nutritional needs from the gardener. To ensure your plants are adequately fed throughout the growing season, use a potting mix containing a slow release fertilizer. Potted plants need to be watered more frequently than those grown in the ground. Check plants daily. Make sure the soil is always moist (but not wet) and never let the soil dry out completely. Wet leaves can lead to fungus, mildew, disease and sunburn, so only water the soil and not the leaves. Add enough water to reach the roots at the bottom of the pot. A good indicator that you’ve watered enough is when the water begins to run out of the drainage holes. Just like any other garden, container plants are susceptible to pests. Use insecticidal soap or horticultural oil to fight aphids, mites or whiteflies. Tomato hornworms should be handpicked off plants and destroyed. Most vegetables are suitable for container gardening. There are dwarf varieties available, but most standard plants will grow just fine in the right size container. Plants can be grown from seeds sown directly into the soil or from transplants. Here is a guide to some vegetables commonly grown in containers and their needs.